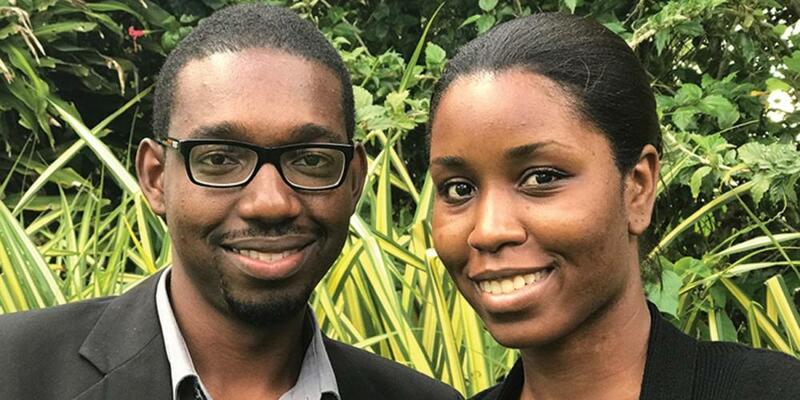 Junior and Stephanie Roberts faced trouble when they stopped catering on Sabbath. New Life Center, Holbrook SDA Indian School, Arizona, U.S.A.
Ebeye Mission School, Marshal Islands, U.S.A.
To Sabbath School teachers: This story is for Sabbath, March 31. Click here for photos to share while telling the mission story. Participants: Interviewer and a young man and woman to present the story in the format of a Q&A interview. Note: Participants don’t need to memorize their parts, but they should be familiar enough with the material that they do not have to read everything from the script. Practice so that participants can feel comfortable adding inflection where appropriate. You can also view a short YouTube video of Junior and Stephanie Roberts at the end of this story. Interviewer: This quarter we have met people from Puerto Rico, Mexico, Jamaica, Trinidad and Tobago, and Belize, which are all countries in the Inter-American Division. Today we will meet a special young married couple from Jamaica. Junior and Stephanie Roberts own and operate a catering company in Kingston, the capital of Jamaica. They ran into trouble when they were baptized and changed their business model. They stopped serving lobster and liquor, and turned down lucrative contracts on Friday nights and Saturdays. Let’s start with some background. Could you first tell us your ages? Stephanie: And I am 27. Junior: We both worked at a major meat and alcohol company in Jamaica. I was a chef, and I created recipes using shrimp, lobster, and other seafood. Stephanie: I worked as assistant manager in the wine and spirits department. I personally loved wine. Interviewer: How did you learn about the Seventh-day Adventist Church? Junior: Three years ago, an Adventist friend invited me to small-group Bible studies in his home. I found the Bible studies interesting, and I invited Steph to join me. But she wasn’t interested. Stephanie: I was busy and didn’t want to make the time. But when I started attending the Bible studies with Junior a year later, I was stunned with what we read. I asked, “This is in the Bible?” I saw that the Sabbath was mentioned often, and I realized that Saturday was the right day of worship. One day, I sensed the Holy Spirit saying to me, “It’s time,” and I decided to give my life to God. Even though I ate pork and shrimp, and loved wine, it wasn’t hard for me to let them go. I thought, “I have to be accountable now that I know what is right.” I don’t think wine is more important than salvation. Junior: Steph and I also wanted to make sure that our relationship was right with God. We were married in September 2015 and got baptized together one month later. Interviewer: What happened to your catering business? Stephanie: We were told that we would not survive because most catering events happen on Friday night and Saturday. The best clients also tend to order exquisite seafood and alcohol. We actually took a big cut in income when we got baptized. Junior: Right after getting baptized, a client told us that he wanted a seafood wedding worth 1 million Jamaican dollars, or U.S.$7,700. He named all the types of seafood that he wanted and said the reception would be held on January 2. I looked at the calendar and saw that January 2 fell on a Saturday. We had to walk away. One of the first regular contracts that we lost was with an affluent businesswoman. We catered her evening meals several times a week so she wouldn’t have to cook for her family of four. But after we were baptized, we told her that we would no longer serve her favorite dishes with lobster and pork. Surprisingly, she also told us that she had started to go to church on Sundays. We are praying that she will accept the Sabbath. Interviewer: How do you survive in the catering industry? Stephanie: For a couple of months, we had to survive on almost nothing. Our income went way below the average wage for a while, but a surprising thing happened. Relatives and friends began to bring us food. They had received packages of food from others and wanted to share. We never asked anyone for food, and we were never hungry. We had so much food that we were able to give some away! Junior: Our catering company is better off now than before. We didn’t have a moral compass before. Now we know the kind of clientele that we are looking for, and our income is more stable. We try to establish long-term relationships and have more office parties and small dinners than large parties. There is no stress or burden about setting aside the Sabbath. We work Sunday through Thursday and slow down on Friday so we can transition into the Sabbath. Interviewee: Are you happy with your decision today? Junior: I would like to encourage Seventh-day Adventists to speak more openly about their faith. I only recently realized that two of my high school classmates were Adventists. They went home early on Fridays and never said why. I wouldn’t have had to wait 10 years to learn about the Sabbath if they had shared their faith. So, I encourage people to speak out more. If we would just share more, more people would know Jesus. Interviewee: We should never be ashamed of being Seventh-day Adventists and should always be ready to tell others about the reason for our hope in Jesus’ soon coming. Let’s give a generous Thirteenth Sabbath Offering so more people in the Inter-American Division can learn the good news that Jesus is coming soon!